On July 22, an extraordinarily long line was witnessed in front of a certain restaurant called Shake Shack in Gangnam, the first branch of Shake Shack in Korea. Rumor has it that the customer who had the first bite of the famous burger waited in line for ten hours. Despite the extensive line, a number of people are still willing to go to Shake Shack. However, there is a burger place in Itaewon where delicious and special burgers are served as well. It is Nong Chon Burger run by a former manager of Shake Shack New York and more people are visiting because of positive reviews about its delightful taste. The Hanyang Journal introduces Lee Seung-jin, CEO of Nong Chon Burger, the new hot place to grab burgers. Q. Your working experience at Shake Shack stands out seeing as you are now an owner of a burger place. Have you always been interested in the burger business? A. In fact, what I am aiming to do right now is to build up my own brand, rather than just to run a restaurant. I wanted to make my own food brand in Korea and the burger is the just beginning. I prepared for more than five years and started from the bottom. First, I majored in Food Service Management at Johnson & Wales University and working at Shake Shack was the next step. 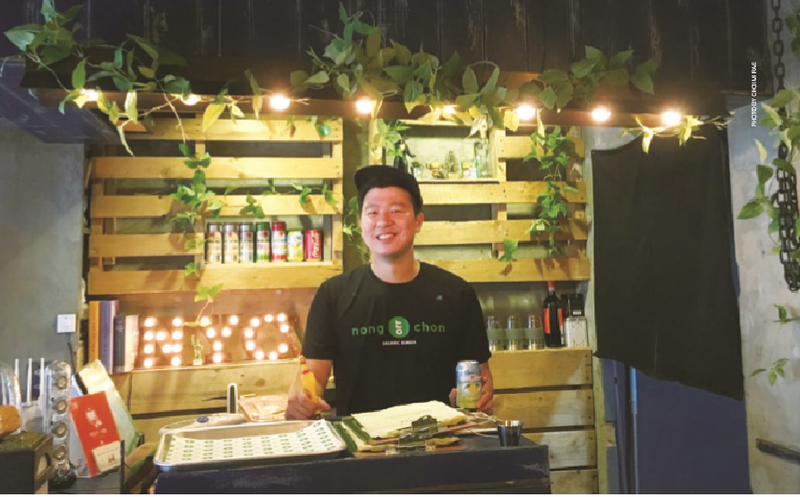 It has been about eight months since Nong Chon Burger opened and a pizza place called Nong Chon Pizza is also under way. I think it will open at the end of this year. Q. Nong Chon is a Korean word meaning ‘farm village’. It is interesting because most burger places have English names. Why did you choose Korean word, Nong Chon? A. When people around me heard that Nong Chon is going to be the name of the restaurant, many of them told me to think of other English words. However, I wanted my brand to stand out as I was starting the business in Korea and tried my best to make different and original burgers. For example, I used food with domestic characteristics such as Korean beef, red snow crab and squid ink (for buns). So I held on to my decision and chose Nong Chon as the name. Plus, I already had knowledge that Shake Shack was going to open before most people did. Although my friends were concerned about my business, I did not really care. I am sure about my own philosophies about my brand and the path that I have been walking. I am looking at the big picture so I don’t want to rush impatiently while worrying about other stuff. If someone thinks that I am just copying Shake Shack, that is a mistake. As I said earlier, working there was one of the steps to the next level in my life. Q. Other than the taste of burgers, what was the most important part regarding the overall process of your business? A. It is hard to pick just one as the food business can be affected by numerous factors. There were so many to take care of before opening, from the taste of the food to the location of the restaurant. As you can guess from the word ‘culinary art’, the food business is a highly complex field. All the elements should be in place for the whole thing to work. To make the best combination of ingredients for Nong Chon Burger, I used to eat more than ten burgers a day. I specifically went to about 100 bakeries just to find the best bun. For the location of the store, I counted how many people passed by different places in Itaewon. Regarding the decoration of the restaurant, I focused a lot on the lighting, ornaments, plating and such which got positive reviews on SNS. Q. An increasing number of young students are thinking of opening their own businesses these days. Do you have anything to say to them? A. I want to emphasize that thoroughly preparing is important. It is too dangerous to just go for it without properly preparing because it is something that money is involved. Realistic insight matters a lot. It is important not to rush or feel hasty and setting long term goals can be helpful. To give a little tip about the food business, starting small as a local business and later targeting the bigger market is what seems to work considering the recent trend.